Southwest of Ermioni, close to modern Porto Heli, the ancient city of Alieis was founded at the end of the 7th century BC. It flourished between the 6th and 4th centuries BC. 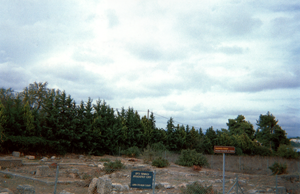 Following the destruction of Tiryns by the Argives in around 460 BC, many Tirynthian exiles settled here, which is demonstrated by the coins of the city of Alieis which bear the inscription 'Tirynthion' [of Tiryns] and date from the end of the 5th century to the beginning of the 3rd century BC. Pausanias refers to the city as Aliki, while on columns in Epidaurus, it is referred to as Alieis. Herodotos refers to them (7,137) as 'fisherman from Tiryns' [Alieis = fishermen]. During the Peloponnesian War, due to its strategic position, Alieis was successively occupied by Athens and Sparta. The city had a fortified enclosure with circular and rectangular towers, as well as five main gates. Outside the walls were the sanctuary of Apollo and the stadium, while inside the Acropolis there was an outdoors temple dedicated to Athena Poliada. With its organised urban plan, drainage network and irrigation system drawing from wells inside the living areas, which were arranged around central courtyards, the city, which must have had a population of 2,500, developed important activities most of which supported the economy by the exploitation of olive oil and textiles. To the southeast of the ancient city, were the graveyards which include pit and cist graves, stone sarcophagi or burials in giant vases, as well as cremations. In contrast with common practice, the grave goods, mostly clay pots, were not placed inside the tombs, but on top of them. 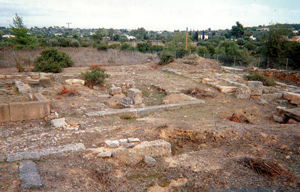 Alieis was abandoned shortly after the end of the 3rd century BC.